It comes in all forms for the interior. INPRO has been rocking the scene since 1989. The finest fruits, slow cooking, homemade recipes & a whole lot of love. That's the Belberry secret. Connecting the smart community in the Benelux —true smart lovers that are in love with the city. Recticel points you to the insulation product you need, instantly. At Foodpairing®, they know what's hot and what's cool. No real eskimos or penguins here. Only cool designer underwear for men at its finest. Parcels delivered to people, not addresses! Water is life. Today, people view the bathroom as their own personal space. We gave Geberit a platform for everything from inspiration to innovation. They say a picture is worth a thousand words. Or how about thousands of brightly coloured bottle caps? They've been producing artisanal marmalade and fruit preserves like no other since 1956, and are considered one of the world's finest. Tickle your taste buds with Belberry, official supplier of the Belgian Royal Family. We were more than honoured to design and develop them a sturdy website, including a recipe directory with their exquisite products as the main ingredient! In cooperation with Webveille, we created the social media strategy for smart. The proposition: "be different, be smart" —smart isn't just a city car, it's a true lifestyle. We are responsible for the smart Benelux' allround conversation management (Facebook, Instagram, Twitter & LinkedIn) and the occasional smart city photoshoots. As one of Europe's leading manufacturers of insulation material, Recticel aims to service their customers in the friendliest possible way and goes to great lengths to avoid confusion. Pretty important when you have a wide range of products to offer. Monokroom built a tool that leads customers straight to the right product. This multicountry app is optimized for large touch screens, mobile and desktop devices. At Foodpairing®, they know what's hot and what's cool. This US- and BE-based creative food tech company appointed Monokroom to design and develop a microsite for their latest technology: Consumer Flavor Intelligence. 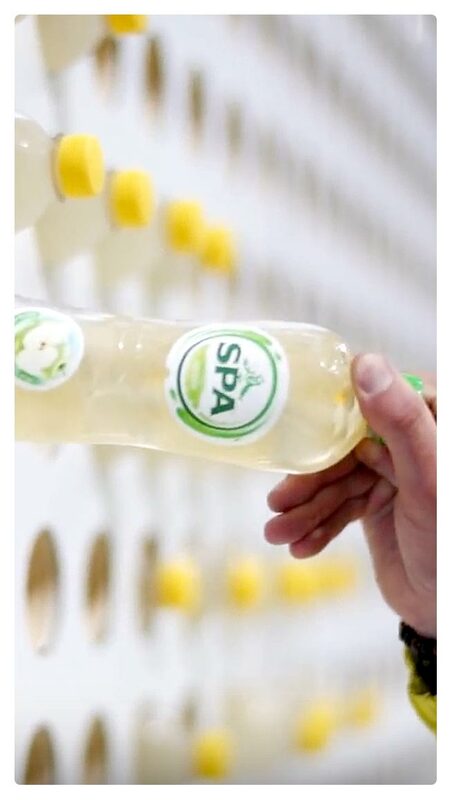 It allows them to stylishly target medium and large customer-centric enterprises to answer the fundamental question: What flavor should I launch? Designer underwear and swimwear for men. OriginalEskimo™ is a Belgian brand with international reach and known for their collabs with top-shelf artists, such as Norwegian producer Todd Terje. 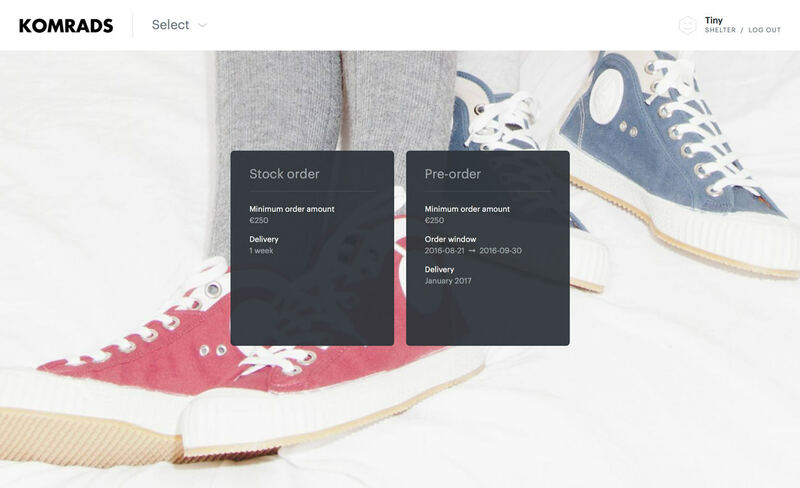 Monokroom designed and developed a slick and unique online shop, powered by the popular Shopify platform. 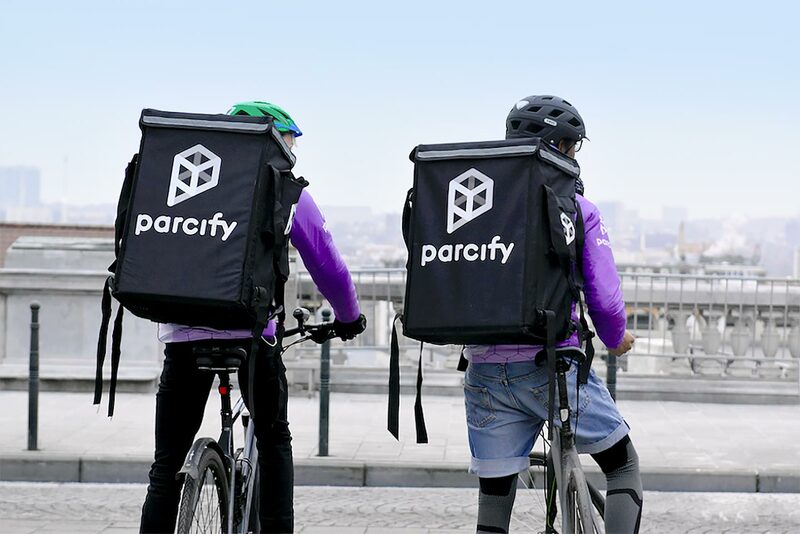 Parcify is a groundbreaking and quickly expanding parcel delivery service. They bring your ordered packages not just to your home like you're used to, but wherever you are at that moment. We helped kickstart their visual identity by designing a unique and recognizable logo, house style, iconography and mobile app interface. Geberit Belgium sought ways to increase product awareness among interior designers and its presence in the design community. Their premise: "Design Meets Function". In cooperation with Webveille, we developed a well-thought-out social media strategy. To ensure that their message reached a larger audience, we are using channels such as Facebook and Pinterest. The result? A perfect platform to engage with design professionals and prospective customers. Iconic footwear brand Komrads makes cult sneakers based on the original model by the Czech Boot Company. An urban shoe as a cherished symbol of soviet craftsmanship. Monokroom designed and developed a foolproof B2B online ordering system. 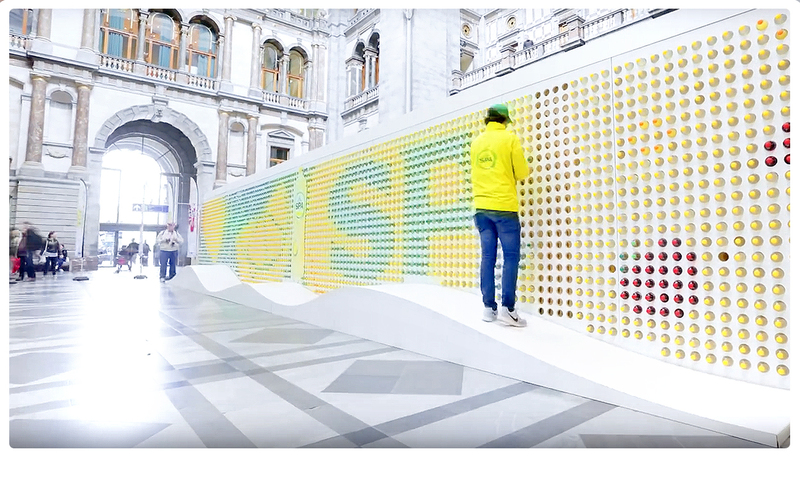 We created three pixel artworks, each with 2.985 bottles to visualize the Spa Fruit flavours in a huge refrigerated pixel wall. While sampling, one visual morphed into another, revealing all the fruity lemonades. 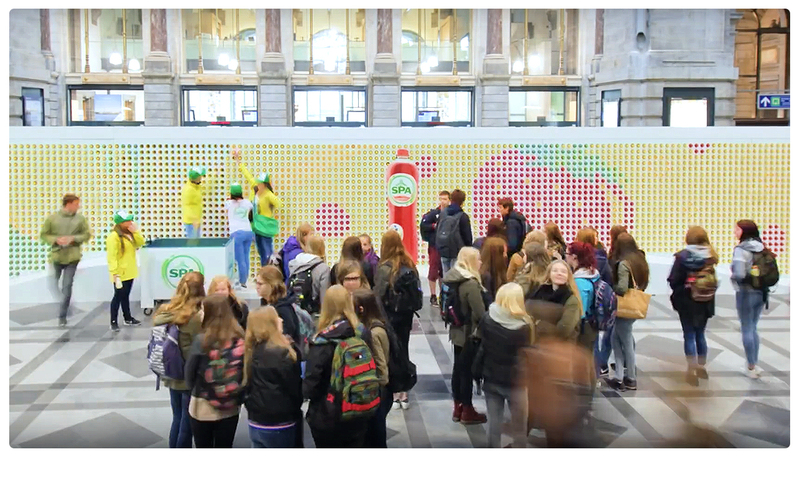 The billboards were set up in Antwerp and Liège Central Station, reaching thousands of consumers every day. Inventors of the campaign are the guys over at Darwin. Good design means good balance between practicality and aesthetics. We absorb, think, wireframe and securely work to showcase your brand or message in the most attractive and interesting way possible, even when it gets technical. We specialize in logo design, art direction, information architecture (IA) and interactive user experience (UX), tailor-made for instant publication online or off. We know how it works by now. Since 2001, we haven't stopped building web stuff on a pro basis for clients big and small. Mono- and multilingual campaign websites, e-commerce interfaces and single-page browser apps (SPA), usually driven by a database with dummy-proof content management system (CMS), and optimized for use on mobile, tablet and desktop devices. We help you spread the word about your business by analyzing your online presence, determining the opportunities and creating a clear social media strategy that fits your brand and budget. Conversation management isn't just about chatting to people — it's about activating the right people on the right channels, whether it’s on Facebook, Instagram, Twitter or LinkedIn. Monokroom is an independent studio based in the historic city center of Mechelen, Belgium. Our talent is to inject projects with creativity and execute ideas in the finest possible way.